Sony turned heads at its press conference with its new Bravia LX900 3D TV. Sony turned heads at its CES 2010 press conference by showing off its new Bravia LX900, HX900, NX800 and EX700 HD TV models for 2010. An undoubted star of the show is Sony's new 'Signature' range and the feature-packed Bravia LX900. Available in 40-inch, 52-inch and 60-inch sizes, this 1080p, net-connected, edge-lit LED 3D TV is an early adopter's dream. Sony says that its 200MHz Motionflow Pro technology boosts the performance of the LX900, delivering smoother onscreen video and image blur reduction across the glossy OptiContrast panel. The new flaship 3D telly also comes packing built-in Wi-Fi (802.11n), DLNA support and Internet widgetry to give you access to YouTube, Flickr and Facebook. A Bravia Internet Video feature will also offer built-in catch-up TV functionality, starting with Demand Five later this year. Of course, there's also a nod to eco-friendliness. The LX900 not only incorporates an ambient light sensor for automatic screen dimming based on lighting levels. It also features an Intelligent Presence Sensor, which will monitor whether there's actually anybody watching it. The LX900 is also something of a looker. Note the eye-catching 'Monolithic' design – Sony's 2010 Bravias are now deliciously thin black slabs with echoes of Arthur C Clarke's alien object from 2001: A Space Odyssey. 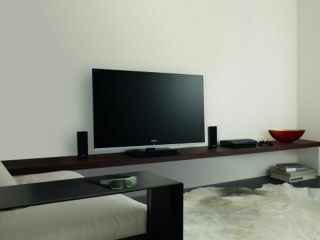 It's a "minimalistic, functional style" that carries across Sony's other new HD TVs for 2010. A step below the Signature range, Sony's new 'Cinematic'-badged HDTVs incorporate the HX900 and HX700 models. These Monolithic 46-inch and 52-inch models feature full HD LED screens, Motionflow 200Hz PRO & Image Blur Reduction technology and are also 3D-capable. In fact, the only element missing is the integrated Wi-Fi. The new 'Presence' range, meanwhile, is led by the NX800. Available in 40-inch and 52-inch sizes, these edge-lit LED HD TVs feature Sony's slick Monolithic design, Motionflow 200Hz technology and retain the wireless-N talents of the LX900. The downside? No 3D support. Last, and by all accounts, least is Sony's 'Essential' HD TV range. But don't turn your nose up at the Bravia EX700 and its band of cheap and cheerful brothers. The budget EX700 might lack the hyped-up 3D support and 200MHz Motionflow tech of the other TVs here, but it still boasts a slim, Edge LED screen, built-in Wi-Fi and Motionflow 100Hz. The Essential range features TVs ranging from 32 inches to 60 inches and also includes the following models: EX600, EX500, EX402, EX40B, EX302, BX400, BX300, BX200, BX20D.